There is Life after FIRED! Meet Cheryl and Ed Steward! “Dream a new dream, make a new plan, start a new life." OR career, in Cheryl and Ed's case! This phrase immediately made me think of Cheryl and Ed. It is the caption that is at the bottom of all of my e-mails. Also, the pattern to which I rebuilt my life after one of many of life's catastrophes. The news of being fired at age 50 does not come easy! Please meet Cheryl and Ed Steward. They are living proof that there is life after being fired. Also, courage runs in this family! If you remember Bonnie Corson from a previous “Stories Behind the Quilts”, Cheryl is the sister that Bonnie mentioned in her story. After working at the same company for over 15 years, one day Cheryl was fired. Shock, even if you are suspicious that this might happen, as Cheryl was, still hits like a ton of bricks when the firing actually does happen. Cheryl called Ed on her way home after receiving the bad news and said, “What would you think if I quilted for a living?” His response was a bit surprising to her when he said, “sure, I believe we should try.” Usually Ed likes things “buttoned up” and secure so when he was open to the whole idea of starting a business, it was just the tonic to Cheryl’s spirit that allowed her to re-focus her work life, make a plan and start a new career. Although Cheryl now owns a new Innova, she is pictured in the photo on the left with her old machine and her new Innova on the right! ​Just in case you were wondering, Cheryl was not fired because she was a bad employee but she was fired because she was the biggest expense to the company and they were trying to keep the company growing after the one of the owners passed on. She worked for a sign company, had been there for 15 years, had built her salary on commission, drove a company car and did a lot of traveling. So the amount of money she had grown into, came from dedication and hard work. Her income earned not only her wages but also was the life’s blood of the company. When one of the owners died, the remaining owner brought his wife in, fired Cheryl and felt that they could sustain the company with his wife filling Cheryl’s position. Ultimately, the business struggled and closed its doors just two short years later! Cheryl, being the business woman that she is, did her homework. She called people, complete strangers, all over the country and asked how they felt about being in the quilting business. She got all positive information that was uplifting and helpful with the exception of one lady who had nothing but bad things to say. “Doing the math” during the conversation, Cheryl understood that she was not doing quality work and did not get repeat business. I asked Cheryl how she started getting work in the door. Her honest reply was, “I had to think outside the box a bit and think of ways that we could get business.” And “think outside” the box she did. She put herself out there and pounded the pavement and burned up the telephone wires. In order to get her business started, she visited all types of businesses that she felt would benefit from her services. Some said no, yet others were quite open to her ideas about promoting her products: t-shirt, memory and regular quilts. She also joined a quilt guild. Cheryl and Ed now do around 500 quilts a year-with only one machine! 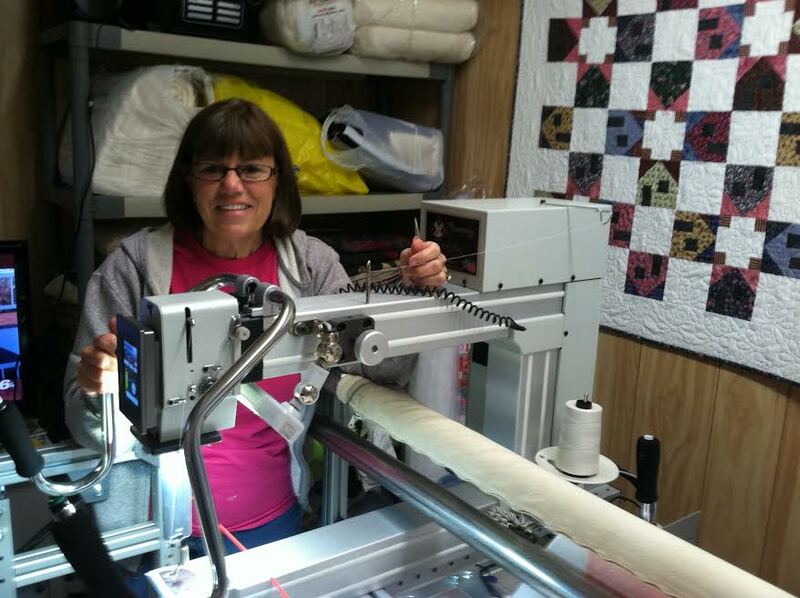 She bought her first machine from Jeff and then upgraded a couple of years ago with an Innova. It is through her that her sister Bonnie bought her Innova. Both sisters love their Innovas! Ed was let go a year later due to the economy and because the company failed so they did not bring Ed back either! Ed, just trying to be helpful, started helping Cheryl. Instead of there being no hope in his career, Ed re-focused as Cheryl did and filled the empty places that Cheryl needed help in! Ed has been retired 2 years and now and was able to go on Social Security. Cheryl stressed that when they started this business they had to change their lifestyle. They did not go out to eat as often and there were other cost saving measures the couple took. They sacrificed for the future they wanted. When they bought the new Innova, they paid cash. They are now living decently on their income. I do have to say HUGE KUDOS to Ed though. Cheryl told me how he has become her “Man Friday”. As Cheryl puts it jokingly, he is her traffic director! He said that at times there were so many cars in the drive that he had to direct traffic and help out! He mans the phones when necessary. He goes to the fabric shop with a swatch to pick up backing, batting and other items Cheryl needs. He cooks and cares for the house as needed while Cheryl is working at the shop. Cheryl and Ed are true partners in every sense of the word. Below is one of the quilts that Chery did for a client. Cheryl says that if she could afford two machines, that would be her one wish. She traded in her old machine on the new Innova. If she had a second machine, she could put custom work on the hand guided machine and edge to edge on the AutoPilot. I do have to share this one last thing with you. Cheryl said she would truly be remiss if she were not to share with all of you that it is their faith in God all along the way and that they have to give Him thanks for this new start that they have. They give Him the glory. Cheryl, dreams do come true. You and Ed are the true picture of the American Spirit. Dreams, hard work, commitment to see those dreams realized, not waiting for someone to hand you something, doing good honest work at a fair price are all exhibited in your daily lives of living, loving and growing your business together. Hats off to you both! WE hope you get to realize the success of being so busy that you have to buy that second dream machine!! Thanks for your loyalty Innova and to Accomplish Quilting families. We appreciate your business and your friendship and thank you for sharing your wonderful story with us!